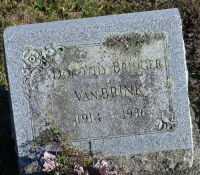 The death of Mrs. Dorothy Pearl Bridger, wife of Harry Van Brink, of East Springfield occurred at 5 o\'clock on the morning of January 1st at the Mary Imogene Bassett Hospital as a result of a complication of diseases. She became a patient at the hospital on November 21st..
Mrs. Van Brink was the daughter of Floyd and Ida (Thayer) Bridger and was born in the town of Middlefield Feb. 26 1914. the greater part of her life had been spent in the town of Springfield. She was a true and loving wife and kind neighbor. A host of friends will feel a sense of deep personal loss in her passing. She was united in marriage with Mr. Van Brink in October, 1931, at Springfield Center, and he survives, together with her parents; two children, Harry, Jr., aged two and a half years, and Shirley Ann, aged sixteen months; four brothers and five sisters, Norman of East Springfield, Raymond, Robert,Everett, Helen, Thelma, Ruth, Dora, and Beverley Ann, all of Cooperstown. The funeral will be held at the Griffith Funeral Home Saturday afternoon at 2 o\'clock, the Rev. H. M. Pease, pastor of the Cooperstown Baptist church officiating. Burial will be made in the cemetery at Springfield Center. [S3922814008] Obituary Personal Collection, Van Brink, Dorothy (Bridger), Otsego Farmer, P 3., 3 Jan 1936.